I got to use my traces/tracks/spoor/monster/lair table for encounters this week and found out it doesnt work for hex crawling. If you recall, I was rolling every four hours and cleared the encounter track every night. 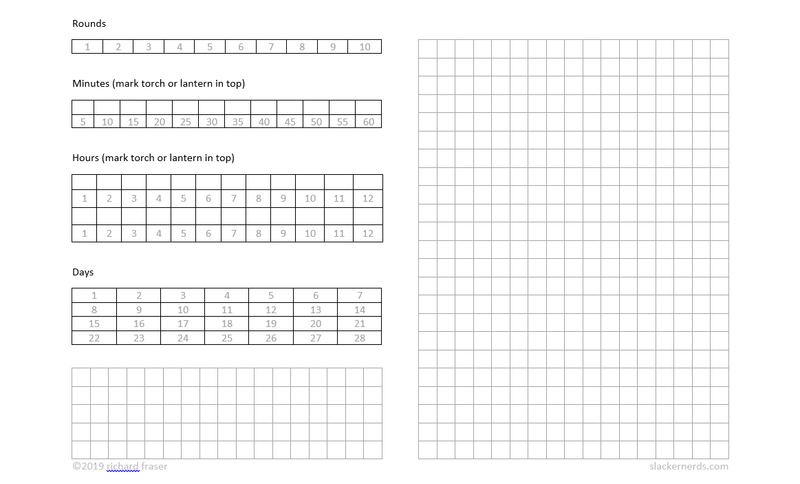 That means I need six (remember there are 2 traces) out of six dice to come up as successes. Why didn't I figure this out? Why didn't you tell me! Well, that's what playtesting is for, my players got off easy! Ok, we have two options here, decrease the DC or shorten the encounter track. Either should work, but which is better? I want an encounter once every few days, let's say twenty five percent chance per day. If I were rolling one d20 I would set a DC 15, as each increment of a d20 is one twentieth of one hundred, or five percent. Looking at anydice 6d20 output, 72+ is about 25% so I'm guessing a DC of 12 without any fancy probability math. Is there a website that will do that for me? To google! Lowering the DC means I still need 6 successes. Or I could use a range. Probably based off of the encounter DC. DC 19 encounter, 17-18 is track, 15-16 is spoor, natural 20 is lair. So looking over this today, I came up with a solution I like and will try. Nat 20 is a lair, encounter DC-1 is spoor, -2 is tracks, -3 and -4 are traces. 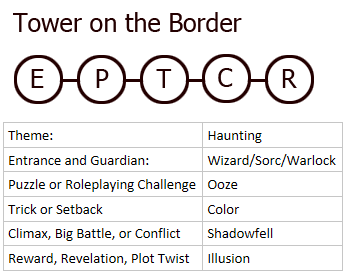 Now to make encounter tables! 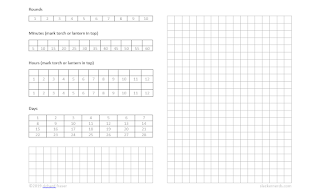 I removed the graph side and pelaced it with a rocketbook page (not shown). 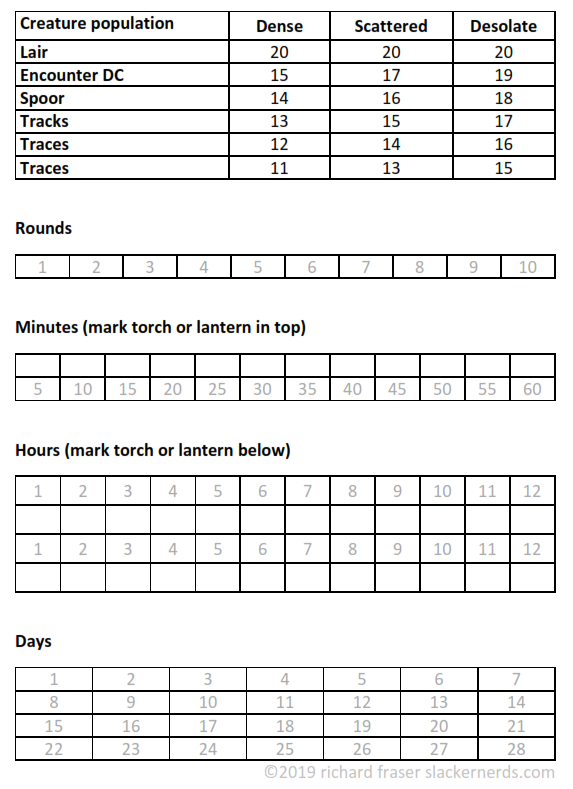 Here is the revised tracker in google drive. I'm so happy about this one. Just a recap of last session, thought I'd get it out before too long. Sorry about the sound on this one, my car window broke and you can hear the garbage bag flattering in the background. The one where I talk failed encounters and dungeons and dragon midgard recap. The Fallen - it was Denzel! 5. Reward, Revelation, or Plot Twist. The first thing I wanted was a theme table to tie the rooms together. I decided on eight different themes or places the dungeon could be. Next I started to work on the rooms. 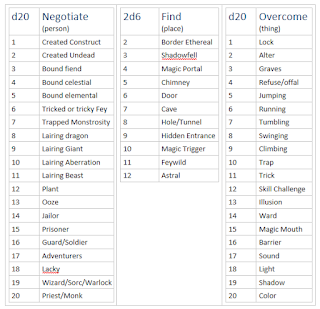 I made some separate table and started brainstorming ideas fitting them into each list. After a few items, I started to come up with things that could fit in multiple lists, sometimes all of them! I decided to take another approach, to break each room up into what generic things could be in them. I came up with something to negotiate with (person), something to find (place), and something to overcome (thing). I was looking for nouns! Now I made lists of people, places, and things. As I looked over these I saw that some of them fit more naturally into the room designs. People fit more naturally into rooms one and four, places in one or three. I decided to weight each room with a negative, zero, or positive; from there picking a randomizer that fit my odds (thanks anydice). 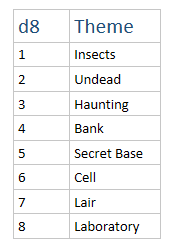 I started tweaking my lists of nouns and realized I needed to weight one of the tables to make some places (planar) more rare. 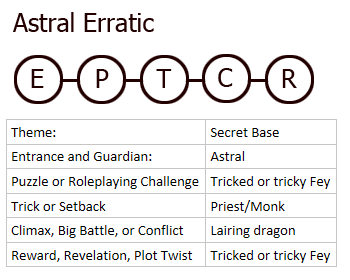 Instead of testing this out with dice, I wanted to run some really quick rolls and see instant results. 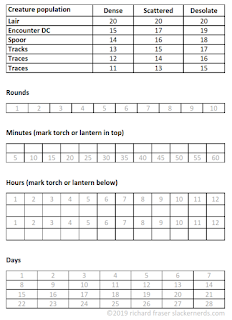 I wrote an excel sheet to help me quickly randomize, copy, and paste. I forgot about the weighting I had done for the places, and you’ll see that in my original results. Without further ado, here are my six Five Room Dungeons. Entrance or Guardian: Upon opening this hidden away area, you notice that it is or was recently inhabited. A tattered rug covers the floor, a table and 2 chairs sit off to the side, a small collection of books on a shelf of a bookcase, a comfy chair for reading and a long hallway stretches off in the distance. The rug hides a pressure plate that starts a slow rumbling in the hallway. If the players move it they can beat the crumbling hall. 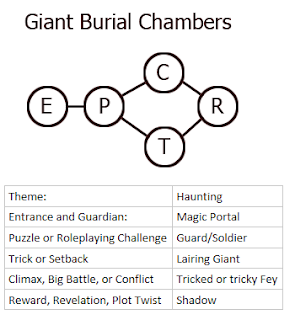 If the players wait, they realize that they will be cut off from the rest of the dungeon if they don’t move. Dexterity saving throw will get them past the falling rocks with no damage, half for failure. After the hall crumbles, it will take 250 man hours to unearth the whole 250 feet. Trick or Setback: This is a large room, it has small mouse sized holes that lead into hidden areas in the walls and ceiling. There is a hag, Hilda, hiding here who entered a pact to guard the vault for 101 years. 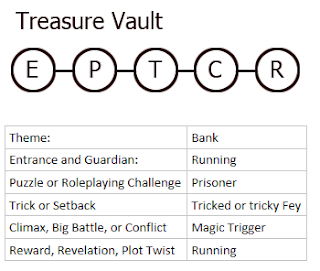 If the vault is breached she will be trapped here forever. The hag uses the holes to enter the walls and cast from cover. Climax, Big Battle, or Conflict: The vault is locked by a large circle divided in to four quadrants. They are colored yellow, blue, brown, and white. To open the lock a spell from each element (fire, water, earth, and air) must be cast in secession. The order does not matter, as long as they are cast one after another. Reward, Revelation, Plot Twist: A sword that contains their souls is here, if used and reduce a creature to 0 HP it will release a soul as a giant shadow under the welders control for 1 hour before vanishing. It has 10 'charges' and turns to a non-magical sword after they are all used, damning the giants souls to the abyss. 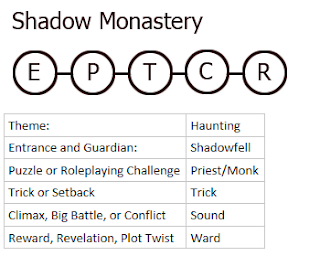 Entrance or Guardian: A haunted monastery lies in near ruins, the veil between worlds is thin here and shadowy apparitions of the former students can be seen eternally practicing, trapped between life and death. An entrance can be found deep in the bowels of the old monastery, linking to a shadowfell version of the building. 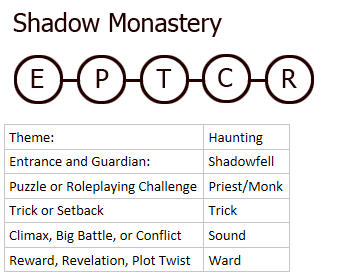 Reward, Revelation, Plot Twist: Before the monk leaves the shadowfell behind, he will open a portal back and give the party a ghost rune. Ghost rune can be transferred to a non-magical suit of armor or weapon. If attached to a weapon, weapon can instead do cold or necrotic damage. If a creature is immune to cold damage, it is reduced to resistant for this attack; if it is resistant it is reduced to normal damage. If the creature does not have a resistance or immunity to cold damage and cold is chosen, critical hits to three times the normal effect. Entrance or Guardian: A haunted tower is guarded by the ghost of a wizard, he warns that the darkness shall destroy you. Puzzle or Roleplaying Challenge: There is a black pudding here trapped in a large glass container with a door facing out. On the other side of this large room is an area that has one inch holes in the floor that go down twenty feet to a pressure plate that opens a secret blue portal. The pressure plate must have the weight a large creature on it (the black pudding). The black pudding can then squeeze its way through a passage under the floor and back into the glass container through a hole in the bottom, resetting the puzzle. Aged by twenty five percent of current age. Polymorphed into a sheep for an hour. Reward, Revelation, Plot Twist: There is a secret room that has a magic mouth that speaks the demons true name, Catullus. 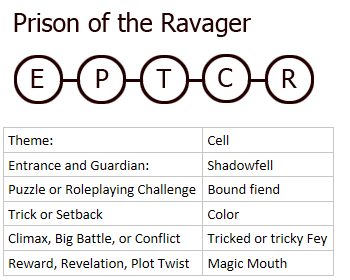 Puzzle or Roleplaying Challenge: A very young, seventy-five, elven ranger, Laira resides here and serves as guardian to the dragon’s lair. She was captured infiltrating the dragon’s lair and has since joined the cause. Trick or Setback: A monk, Ranek, lives here, forced into a contract when the dragon destroyed his monastery on a separate errant in the astral plane. He has been here for only a few years, arriving after the Laira. 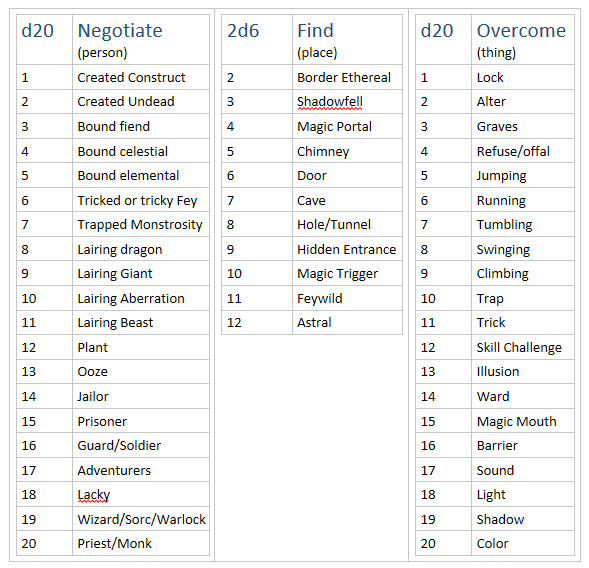 Next is tweaking of the tables to a specific area and using specific monster instead of generic placeholders.